The plane of our Milky Way Galaxy runs through this complex and beautiful skyscape. At the northwestern edge of the constellation Vela (the Sails) the telescopic frame is over 10 degrees wide, centered on the brightest glowing filaments of the Vela Supernova Remnant, an expanding debris cloud from the death explosion of a massive star. 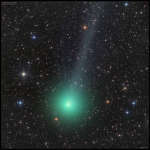 Comet Lovejoy has become visible to the unaided eye. To see the comet, just go outside an hour or so after sunset and look for a fuzzy patch to the right of Orion's belt. Binoculars and a star chart may help. The awesomeness in this image comes in layers. The closest layer, in the foreground, contains the Peak Terskol Observatory located in the northern Caucasus Mountains of Russia. The white dome over the 2-meter telescope is clearly visible. The observatory is located on a shoulder of Mt. Why are the regions above sunspots so hot? Sunspots themselves are a bit cooler than the surrounding solar surface because the magnetic fields that create them reduce convective heating. It is therefore unusual that regions overhead -- even much higher up in the Sun's corona -- can be hundreds of times hotter. What's happening over that town? Close inspection shows these strange columns of light occur over bright lights, and so likely are light pillars that involve falling ice crystals reflecting back these lights. The above image and several similar images were taken with a standard digital camera in Sigulda, Latvia in late 2009. Known in the north as a winter meteor shower, the 2014 Geminids rain down on this rugged, frozen landscape. The scene was recorded from the summit of Mt. Changbai along China's northeastern border with North Korea as a composite of digital frames capturing bright meteors near the shower's peak. At the top right, large spiral galaxy NGC 1055 joins spiral Messier 77 in this sharp cosmic view toward the aquatic constellation Cetus. The narrowed, dusty appearance of edge-on spiral NGC 1055 contrasts nicely with the face-on view of M77's bright nucleus and spiral arms. Comet Lovejoy, C/2014 Q2, is framed like a cosmic Christmas tree with starry decorations in this colorful telescopic portrait, snapped on December 16th. Its lovely coma is tinted green by diatomic C2 gas fluorescing in sunlight. To some, this nebula looks like the head of a fish. However, this colorful cosmic portrait really features glowing gas and obscuring dust clouds in IC 1795, a star forming region in the northern constellation Cassiopeia. These high cliffs occur on the surface of a comet. They were discovered to be part of the dark nucleus of Comet ChuryumovGerasimenko (CG) by Rosetta, a robotic spacecraft launched by ESA which began orbiting the comet in early August. The ragged cliffs, as featured here, were imaged by Rosetta about two weeks ago.